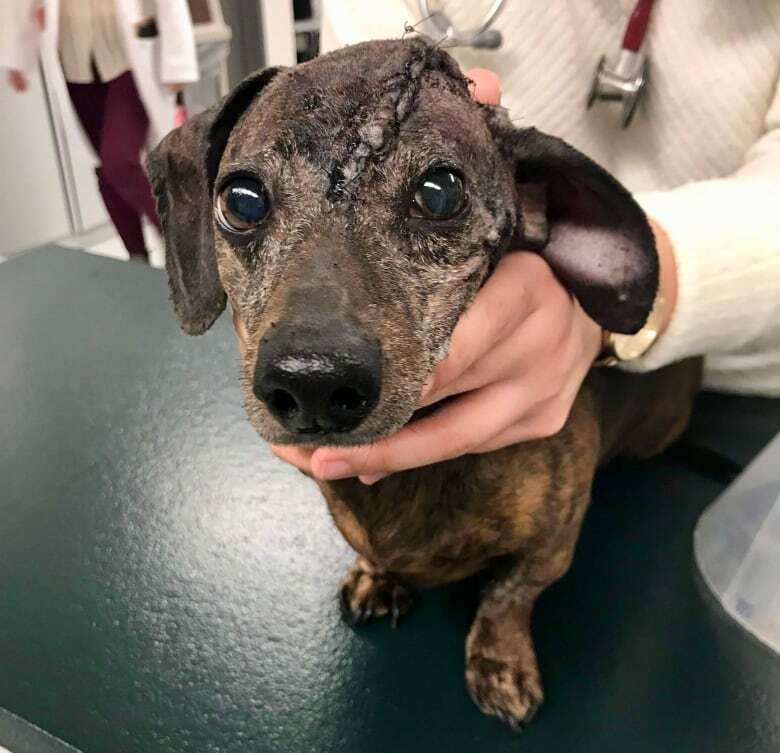 Michelle Oblak, a veterinary surgical oncologist with the University of Guelph's Ontario Veterinary College, said she believes the procedure is the first of its kind in North America and a substantive leap from one other known case. "Our hope is this is something that could be more widely available on a broad scale," Oblak said. "It went very well." 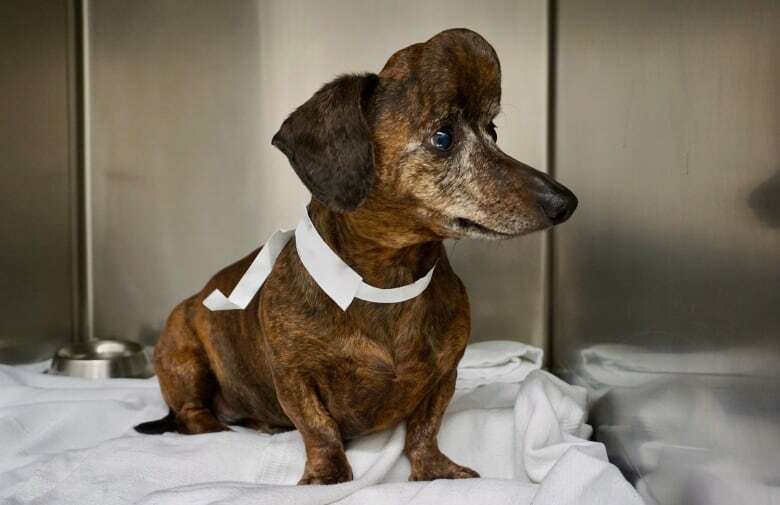 Patches, the nine-year-old dachshund at the centre of the procedure, had a brain tumour the size of an orange that grew through her skull and would have been fatal if not treated, her owner said. "We called her our little unicorn because she had this bump on her head, but it would have killed her," said Danielle Dymeck, who is from Willamsport, Pa.
"It's pretty amazing what they did for my girl." Dymeck said a small bump that Patches had on her head for years began growing aggressively some months ago. Her vet pointed her to Cornell University, famed for its veterinary program, and a vet there reached out to Oblak. The Guelph researcher has been studying using 3D-printing technology — also known as rapid prototyping technology — for dogs. Previously, Oblak said, for a dog like Patches, a tumour and part of the skull would be removed in surgery and then, while the animal was still under, a surgeon would fit a titanium mesh in place. It was an imprecise, costly and lengthy procedure, she said. 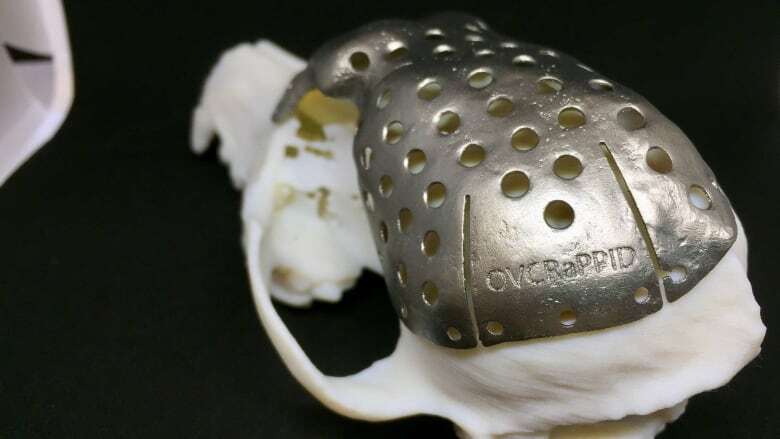 A new kind of procedure, in which a 3D printer creates a custom-made titanium skull cap for a dog, is much better, Oblak said. Patches was the perfect candidate, the researcher said. The dog needed about 70 per cent of her skull removed and replaced. Veterinarians in the U.K. have performed a similar surgery, but it was on a significantly smaller scale, Oblak said. Patches' owner said she had a tough time deciding whether to have her pet be at the centre of the research endeavour, but eventually went ahead. "They felt she could recover from this," Dymeck said. "And to be part of cancer research was a big thing for me — if they can learn something from animals to help humans, that's pretty important." The new method began with a CT scan taking an image of Patches' head and tumour, Oblak said. Using several different software programs on that image, Oblak and her team digitally cut out the tumour and disease-ridden parts of the dog's skull. They then mapped out where a 3D-printed replacement would fit and what it would look like, complete with the location of holes for screws to hold it in place. Those digital plans were then sent to ADEISS, a medical-grade 3D printing company in London, Ont., which made a customized titanium skull cap for Patches. Oblak also had to create a "cutting guide" to follow during surgery. "There's very little room for error," she said. "We're talking less than two millimetres or else the plate wouldn't fit." The entire procedure involved several veterinary surgeons, software engineers and an industrial engineer, Oblak said, but things moved quickly. It took two hours to map out the plans and send them to the printer, and within two weeks, the titanium skull cap was ready, Oblak said. It then took four hours for the surgery on Patches to be carried out on March 23. Within 30 minutes of waking up, the dog was walking outside for a bathroom break, said Oblak, who hopes to have details of the procedure published in the coming months. For Patches' owner, the procedure was nearly perfect. "Her head looks great, other than her crooked ear," Dymeck said of her pet's post-operation look. In a separate incident a week after the surgery, however, Patches suffered a badly slipped disc in her back and her hind legs are now paralyzed. But Dymeck said her dog remains in good spirits. "She has a wheelchair that she refuses to use, so she pulls herself around on her two feet, but she's pretty fast," Dymeck said. "I feel lucky to be her owner, and she's still the boss of the house."